GREEN ISTRIA is intended to be the central Istrian inland, often called also “Istrian Tuscany”. Instead of consistently growing tourism trends in the Adriatic Region in the last years, it has preserved one thing above all: it’s authenticity. 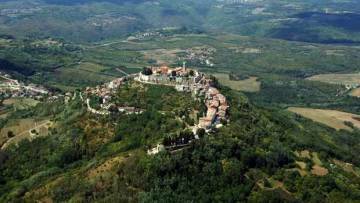 Here, within a radius of 20 kilometers around Motovun, a small town built by the Venetians between the 13th and 17th Century, you can experience the original Istria. Here the clocks tick a little slower, here people can still live of agriculture and here you will find peace and relaxation from everyday stress. The Istrian hinterland is always dressed in lush greenery, even during hot summer periods, and therefore provides ideal conditions for growing high quality foods. In spring the woods are full of aromatic wild asparagus, followed by pale and tasty spring chanterelles. Summer is the ideal time for putting black truffles on the menu. Autumn crowns the year with porcini mushrooms and the king of them all: Tuber Magnatum Pico (white truffle that may be only found in Istria and Piemonte). The most important cities of Green Istria are: Buje, Brtonigla, Motovun, Groznjan, Oprtalj, Buzet, Gracisce, Hum, Pazin, Zminj, Labin, Plomin, Bale, Vodnjan and Svetvincenat.